Check out The Handwork Studio one of the Following Days to Try Us Out! Register your child to Try Us Out on Welcome Wednesday OR Sample Us Saturday's! Ever wonder what a classes are like at our Studio in Narberth, PA? We would like to extend an opportunity to give us a try for FREE! Currently we are taking registrations to join one of our two classes on Wednesdays* or Saturdays*. As a kids' needle arts, machine sewing and fashion camp, our purpose is to pass down the tradition of teaching practical arts such as knitting, hand and machine sewing, embroidery, weaving, quilting, fashion and crafts in a fun and relaxed environment. Our staff is comprised of professional artists, instructors, and skilled teachers dedicated to making each student feel special. 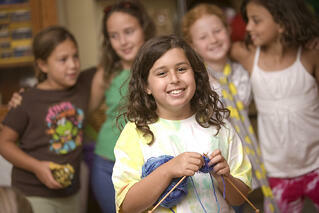 We will lovingly support and respect your child's design choices as they explore their creativity.